"7 Things You Must Know Before You Buy Your Log Home!" Find home plans recommended for you! Like what you see here? Go ahead! Click it! Your opinion counts! Welcome to Big Horn Mountain Log Homes! What my father began 30 years ago with the first blueprint drafted by hand, is today a thriving international business. People from all over the world now come to Big Horn Mountain Log Homes to achieve their lifelong dream of living in a log home. Whether you want to build your own log home, work together with someone building, or have one built for you, Big Horn Mountain Log Homes is here to help you through every phase of making your dream real. Big Horn Mountain Log Homes works with craftsman, contractors, engineers and designers, who are experienced artisans making your log home both unique and comfortable. Whatever your desire for your new home—cathedral ceilings, outdoor living spaces, solar energy, log siding, decks, railings, the list goes on and on—Big Horn Mountain Log Homes can put you in the log home you’ve dreamed about. So, if you’re here in Wyoming where we are, or Montana, Colorado, Idaho, or anywhere in the world, Big Horn Mountain Log Homes can make your dream of living in a log home happen. Call me personally at 307-684-2445 or send me an email and let’s get you started on your dream home! 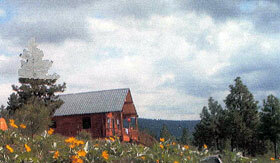 Big Horn Mountain Log Homes has been making dreams come true for over 30 years. The Creekside has received the Log Home Living Editor's Choice Award!